We provide an extensive range of Bathroom Weighing Scales, which is manufactured using duly tested raw material sourced from trusted vendors of the market. 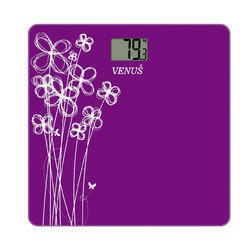 This range encompasses Manual Bathroom Weighing Scale. These Weighing scales are highly sought after in global market, because of its daily level utility. Our scales are known for their water resistance, resistance to corrosion through moisture and accuracy. We are recognized as one of the prominent manufacturers and exporters of premium quality Digital personal body weighing Scale EPS – 2001 that is designed using modern technology in compliance with the set quality standards. These Weighing Scales are light weight, compact and efficient. Available in various sizes and dimensions, these Battery Power Weighing Scales EPS – 2001 are well tested by our experts before dispatching them.